At its Windows 10 Hardware Press Conference held at 10am today in New York, Microsoft announced a suite of new generation hardware devices including the much-anticipated and long-awaited Surface Pro 4 with a Skylake 6th Generation Intel Core processor, up to 16GB RAM and 1TB storage. The Surface Pro 4 has a 12.3-inch screen so it's 40% larger and boasts 267 DPI; that's over 5 million pixels on the screen!!! The good news is that the increased screen size hasn't been achieved by increasing the footprint of the device. Rather, it's been achieved by decreasing the size of the bezel. So there's more real-estate for Windows 10 and your applications. Microsoft's new flagship tablet is the size of a sheet of paper and thinner and lighter. It's 8.4mm thick and weighs just 1.73 pounds (786 grams). 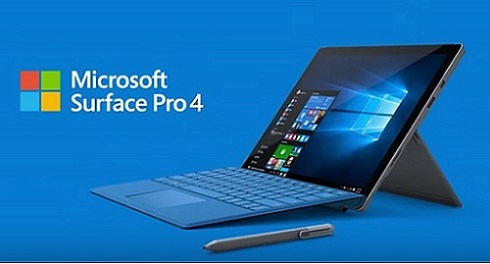 The company has said that its Surface Pro 4 is the thinnest, most powerful Surface yet. It sports the latest Skylake 6th generation Intel Core processor and NVIDIA GPU with GDDR5 memory and has up to 16GB RAM and up to 1TB of storage. The new Surface Pro 4 has a battery life of up to 9 hours. You can pre-order your Surface Pro 4 right now but the devices won't be available until 26 October. 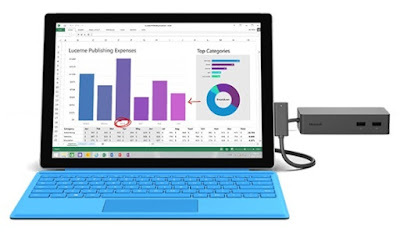 The main accessories for the Surface Pro 4 are the Pen and Docking Station, referred to as the Surface Dock. 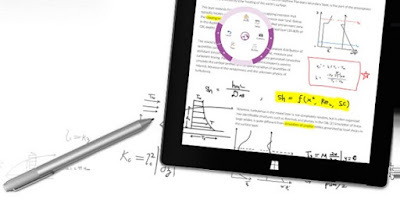 The new Surface Pro 4 Pen enables you to write and draw directly on the Surface Pro 4 screen. With 1024 touch levels of pressure sensitivity and low latency Microsoft has said that the pen will give a real pen on paper feeling. It will be available in 5 different colors and has a tail eraser. The new Pen offers a full-year of battery life. The Surface Pro 4 Pen comes with a Surface Pen Tip Kit with a set of 4 different tips (2H, H, HB and B) to choose from. The Surface Dock docking station measures only 130 x 30mm and thus has quite a small footprint. It features two 4K mini DisplayPorts, 1 GB Ethernet port, 4 USB 3.0 ports and 1 audio output port which easily allow you to turn your Surface Pro 4 into a desktop PC. Plug your Surface Pro 4 into this docking station via a SurfaceConnect cable and you will quickly and easily access external monitors and keyboard etc. The good news is that the Surface Dock is also compatible with both the Surface Pro 3 and the Surface Book. The price of the Surface Pro 4 docking station is $200. For more haute chic fashion and gadget sales follow us on Twitter.